Growing old isn’t for the faint of heart. The new and dynamic generation of seniors living around us aren’t sitting back in their twilight years pining for days gone by. Instead, they’re living it up! Baby boomers are changing what growing old looks like – and we love it. 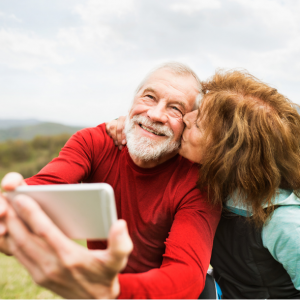 Check out these five cool trends seniors are doing to make the most out of every day. They’re traveling the world, and it’s okay to be a little green with envy. It used to be the young and responsibility-free who were crisscrossing the world, but this trend is changing. The Frequent Flying and Global Trekking Older Travel Report shows seniors (55 and older) are now the ones globetrotting compared to those under 55. Older travelers are becoming much more adventurous and tech-savvy than they are given credit for and they’re filling their days with global travel. The 2017 report also found that those between the ages of 55 and 64 were the only segment to increase long-haul travel between 2012 and 2016 (an increase of more than 19 percent). And it seems as people get older, they only want to travel more often. Those over 65 are the most prolific travelers of the 55 and older market, with 28 percent indulging in two international trips per year. They’re moving in together, and they’re not thinking about marriage. Finding your true love can happen more than once. But it doesn’t always mean a walk down the aisle. Seniors living together is now trending! Unmarried seniors – widowed, single or divorcee – are cohabiting. According to U.S. Census Bureau data, cases of unmarried couples living together is rising rapidly in the US. There were already 18.5 million in 2017 and that number is expected to climb in the coming years. And most of these unmarried couples are older adults. They’re embracing technology, 😊. Smartphone adoption among seniors has nearly quadrupled in the last four years. Based on Pew Research Center data, 93 percent of those aged 70 to 74 reported owning a cell phone, with half of them owning a smartphone. Similarly, 63 percent of those aged 75 to 79 said they own a cell phone, with about one-third having a smartphone. And 58 percent of those 80+ reported owning a cell phone, with 17 percent of them having a smartphone. The next most frequently-used technology was the internet, with 75 percent of respondents aged 70 to 74, 60 percent of those 75 to 79 and 44 percent of those aged 80+ reporting using it. Regarding social media use, 41 percent of those aged 70 to 74, and 24 percent of those aged 75 to 79 actively use social media to engage with family, friends and the outside world. They’re reinventing themselves, and it’s not a money thing. Most people retire in their 60s, and many retirees have a lot of life left in them and don’t want to sit still. The new trend is to find a meaningful purpose to fill their days. That could mean going back to work, but this time, going back to do something they love. Seniors are starting their own businesses or purchasing a franchise business and drawing from their years of life and work experience to drive their success. Some are going back to school to earn a master’s degree, and some are just learning for pleasure. Seniors are reinventing themselves by becoming models, artists, running marathons, teaching, volunteering, and going into public office. Some seniors are even becoming caregivers, especially as home care agencies such as FirstLight are tapping into an older workforce willing to care for clients older or closer to them in age on a part-time basis. Yoga, the most popular form of exercise for older adults. It provides both mental and physical benefits, helps with arthritis, flexibility and blood pressure, and it offers relaxation and stress reduction. Walking clubs mix socialization with exercise. Walking improves circulation, lowers blood pressure and benefits the heart. Balance-oriented and weight lifting classes to help prevent falls. Water-based exercises include swimming, pool walking, and water aerobics. Working out in water prevents falls and strain on joints. Tai chi combines slow, graceful movements with meditation. Benefits include better circulation and balance, lower blood pressure and increased relaxation. What are you or your aging parents doing that’s breaking the mold of what growing old looks like? We’d enjoy hearing from you. Please comment below or join our Facebook conversation where we’re sharing cool things seniors are doing that may have young people wishing they could be more like us.